I had a bit of trouble picking a topic for today. I couldn’t think of a writing topic beginning with Q, and I also don’t have any hobbies beginning with Q. So instead, I though I’d tell you about this awesome TV show called QI (short for Quite Interesting). It’s hosted by Stephen Fry and is basically a trivia game show with comedians competing against other comedians. The goal is to be funny and to be correct, although I’ve never quite figured out how the scoring works (I’m not sure anyone has). Anyway, it’s absolutely brilliant so I urge you all to watch it, love it and laugh your butts off! 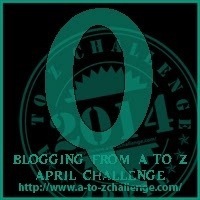 This entry was posted in Blogging from A to Z and tagged blogging from a to z, comedy, qi, television by Emma Lindhagen. Bookmark the permalink.